Being a part of the PfA is exciting and arriving at any event combines eager anticipation with many questions usually starting with – have I got enough business cards to share with these impressive professionals, who, like me, are African but have made London their current home? Stepping out of the taxi on Holborn Viaduct we were hit by just what an unusual and inspiring venue this is. The Koppel Project is a cultural centre with a focus on both international and local artists and we were about to be blown away by the vibrancy and variety of the works of several very talented African artists. Networking encourages the exchange of information and ideas among people who share a common interest. In this beautiful space, it was overpoweringly obvious just how many common interests there were in one place there on Wednesday evening! 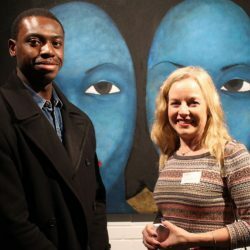 More than 75 people joined us to mingle, see the art and have the opportunity to make new friends and connections as well as enjoy a really interesting panel discussion between the exhibition organiser, Arthur Ayoola and two of the artists. 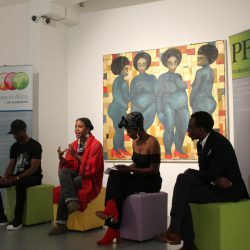 All was very capably chaired by the Zimbabwean-born artist and entrepreneur, Bokini Tshidzu. The artist whose piece was selected as the face of this exhibition, Ayoola Gbolahan, is a gifted and prolific visual artist based in Lagos, Nigeria. He clearly has a following of friends and fans who were thrilled to join him, and he humbly and generously answered questions and described his art and social philosophy. 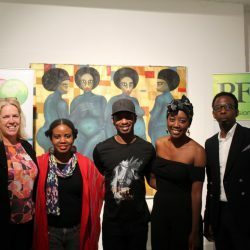 Jumoke Sanwo, an Artist and Lifestyle Photographer out of Lagos too, has had her works exhibited in New York, Brussels, Dubai, Lagos, Sudan, Addis Ababa, Benin, Chad and Ghana. An extremely warm and friendly person, it was mesmerising to hear her describe the connection between her art and music, interweaving important political moments in time. Developing professional contacts is a vital component to gaining valuable future opportunities and the Executives in Africa team was thrilled to meet so many London-based professionals. The PfA has been an excellent source of support and insight, and continually gives us access to like-minded people who have a professional or personal focus on Africa. We look forward to strengthening our networks further and enjoying many more events like this one!